Are you ready? 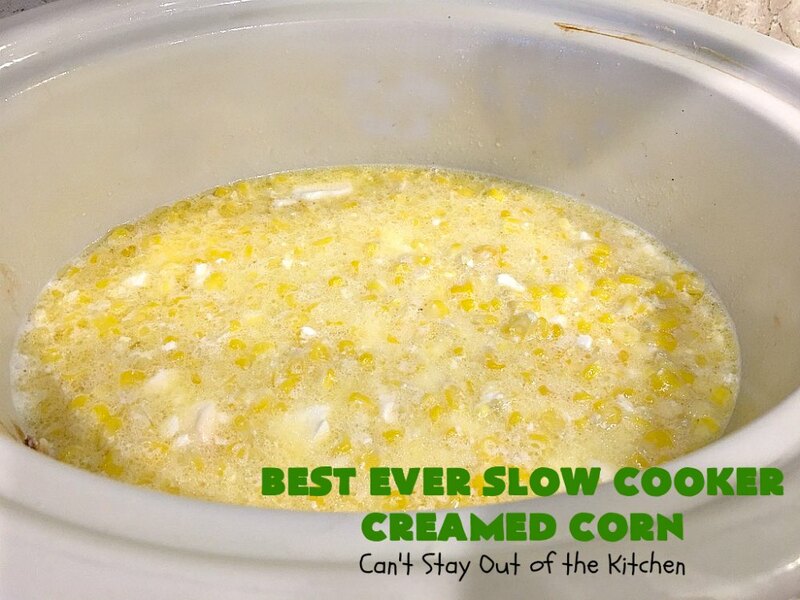 Best Ever Slow Cooker Creamed Corn really is amazing. 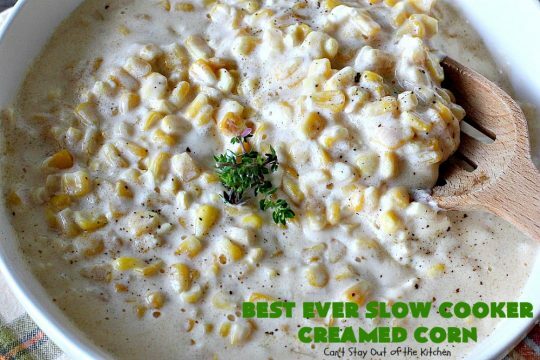 This delicious recipe has the ease of dumping everything in the crockpot. Yes, five minutes preparation time is always great for me. It’s really a simple recipe too. It only takes a handful of ingredients. Those include frozen corn, half-and-half, heavy whipping cream, butter and cream cheese. Yes, it’s high on dairy, but it’s also really wonderful. This recipe is also gluten free. 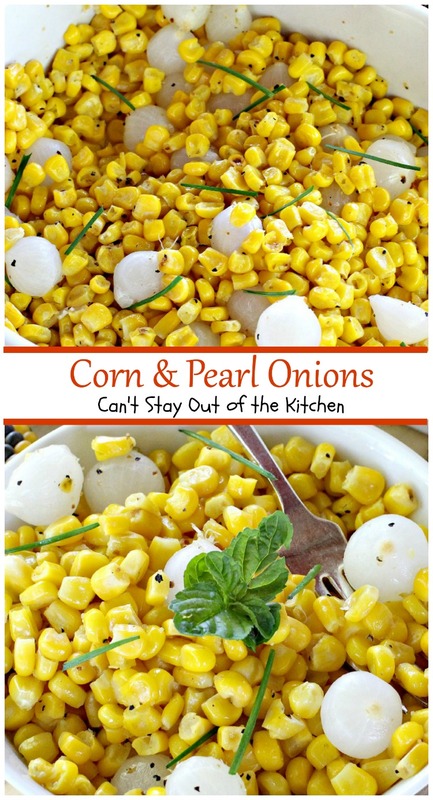 My favorite kind of casseroles to make are side dishes. Give me carrots, corn, green beans, spinach, butternut squash, baked beans, broccoli, asparagus, yellow squash, zucchini, potatoes, tomatoes, beets or brussels sprouts. But give them to me in casseroles! Yes, I love making side dishes. Every Friday night we have a care group from our church over to our house for dinner and Bible study. I always make a main dish. But as often as not, I’ll try to make a couple of side dishes to serve with it because they really are my favorite thing to make. 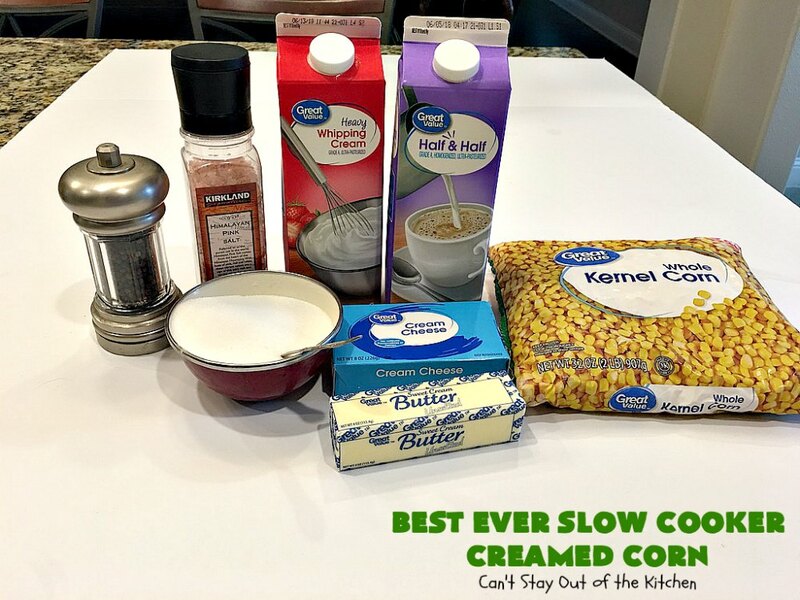 Back in May, I served Parmesan Chicken Bake with Pesto Red Potatoes and this lovely creamed corn recipe. Quite frankly, I was a little freaked out at the texture when I first took it out of the crockpot. It seemed very thin and not at all like the pictures of the recipe I followed. So I went back and reread the blog post and the author stated that the recipe will actually thicken up after it sits out. That’s exactly what happened. The original recipe says to cook this on low for 4 hours. I was using my smallest crockpot which is also the slowest. So I cooked it on high 4 1/2 hours to make sure it was done. After it set out about 15 minutes the corn actually did thicken up. It turned out so well that everyone in our group raved over it. It was creamy from all the dairy. I could have handled it slightly sweeter. But it was really, really good. 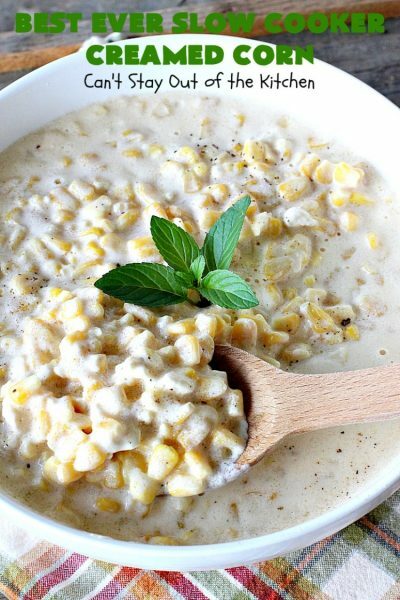 If you want a no-fuss recipe for dinner, this Best Ever Slow Cooker Creamed Corn should be on the menu. It’s terrific for company or holiday dinners too. Don’t freak out if it looks a little thin and soupy after it cooks. It really does thicken up as it sits out. Even the pickiest eaters will love this terrific side dish. 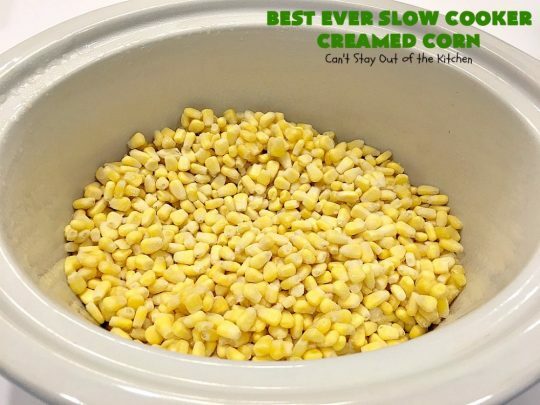 Best Ever Slow Cooker Creamed Corn is a fantastic side dish you’re family is sure to love. I love the ease of this recipe since everything is tossed into the crockpot. 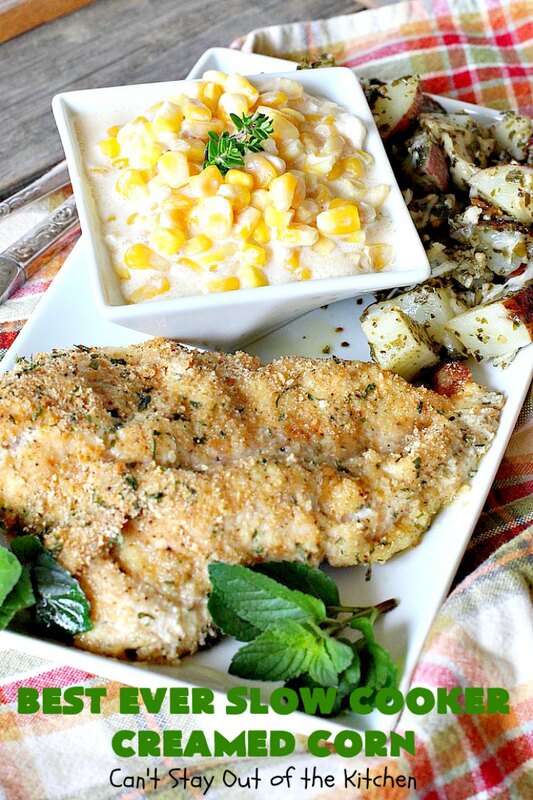 I served Best Ever Slow Cooker Creamed Corn with Parmesan Chicken Bake and Pesto Red Potatoes. Everyone raved over this meal. 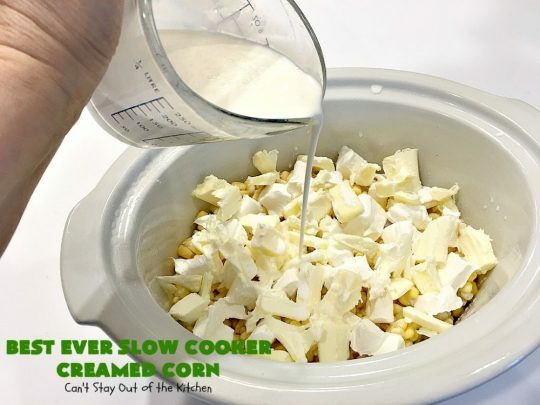 Place frozen corn in the bottom of a crockpot that’s been sprayed with cooking spray. 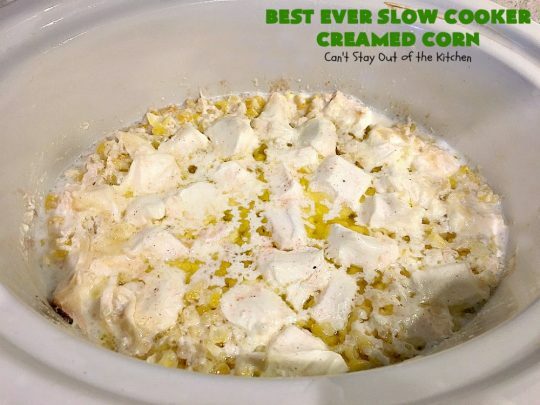 Since I used my slowest crockpot I cooked the corn on high. 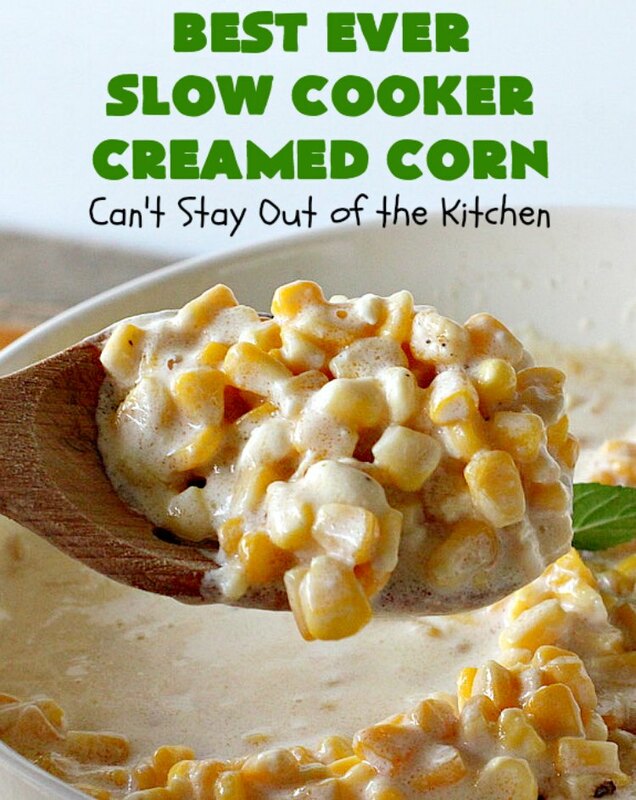 But if I had used any of my other crockpot I would have cooked the corn on low. 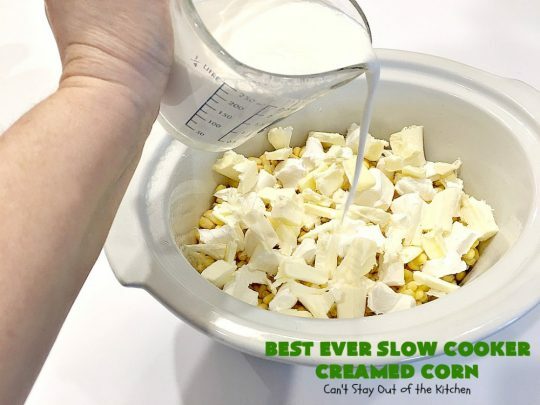 Add cubed cream cheese and slivers of butter. Add sugar. 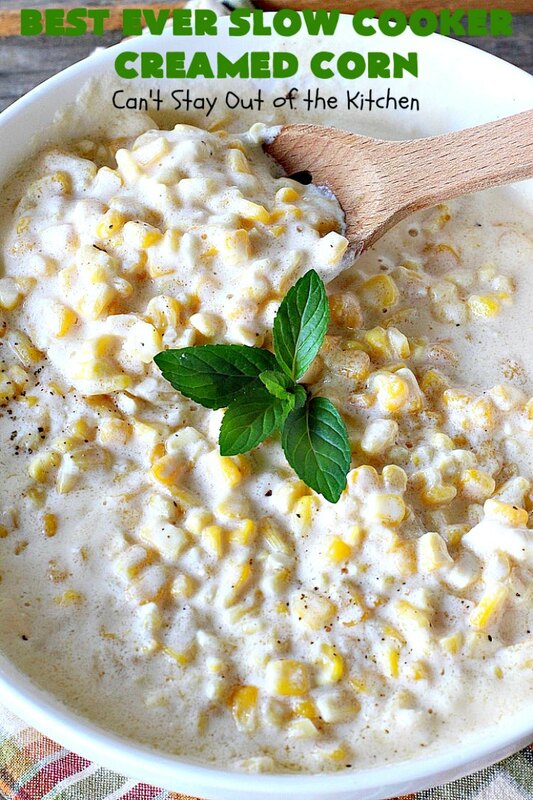 If you enjoy creamed corn on the sweeter side, I recommend increasing the sugar by one to two tablespoons. Add pink Himalayan sea salt. Stir to combine. 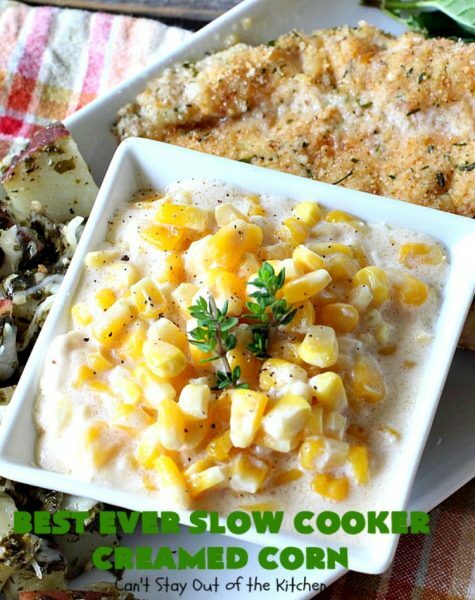 Cook on low or high 4 hours (depending on how hot your crockpot cooks). 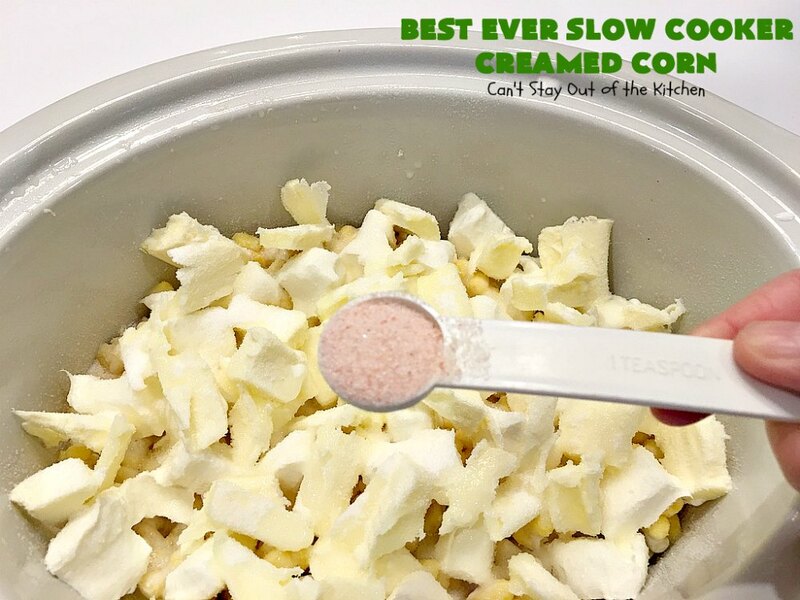 Whisk to break down the cream cheese, if necessary. Stir everything well. Season to taste with pepper. I’m showing you this picture so you don’t freak out that the corn doesn’t seem very thick. This was what mind looked like after 4 1/2 hours on high. I transferred the corn to a serving bowl and after about 15 minutes it did thicken up a lot. 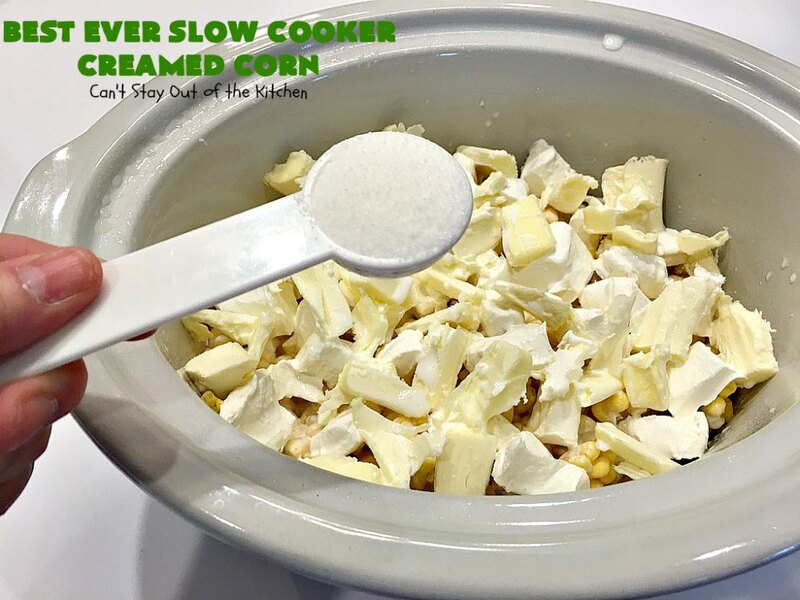 Best Ever Slow Cooker Creamed Corn is a fantastic side dish to serve for holiday dinners like Easter, Mother’s Day or Father’s Day. It’s very little fuss and big on taste. This delicious corn dish was terrific served with Parmesan Chicken Bake and Pesto Red Potatoes. 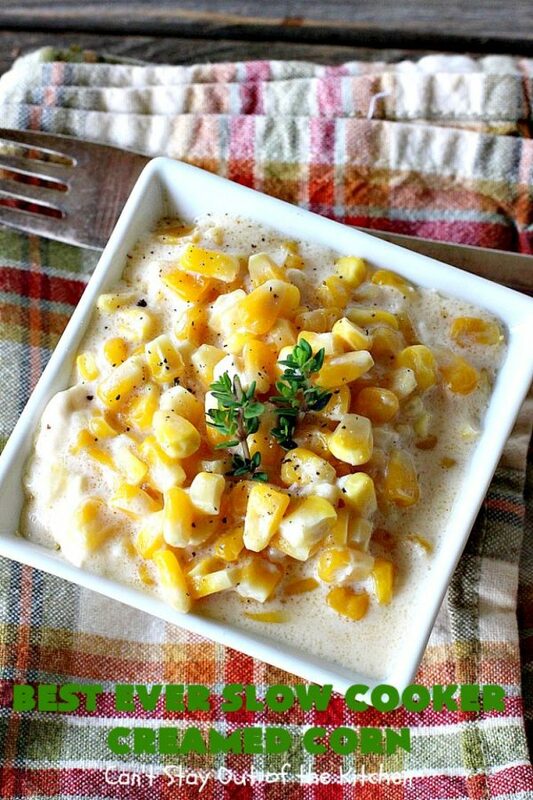 This fantastic corn dish is so simple and easy since everything is tossed into the crockpot. The corn thickens as it sits out making it creamy and heavenly! It's the perfect side for company and holidays like Easter, Mother's Day or Father's Day. Gluten free. Place corn in a crockpot that’s been sprayed with cooking spray. Add cream cheese and butter slivers. Then Pour whipping cream and half-and-half over top. Sprinkle with sugar and salt. 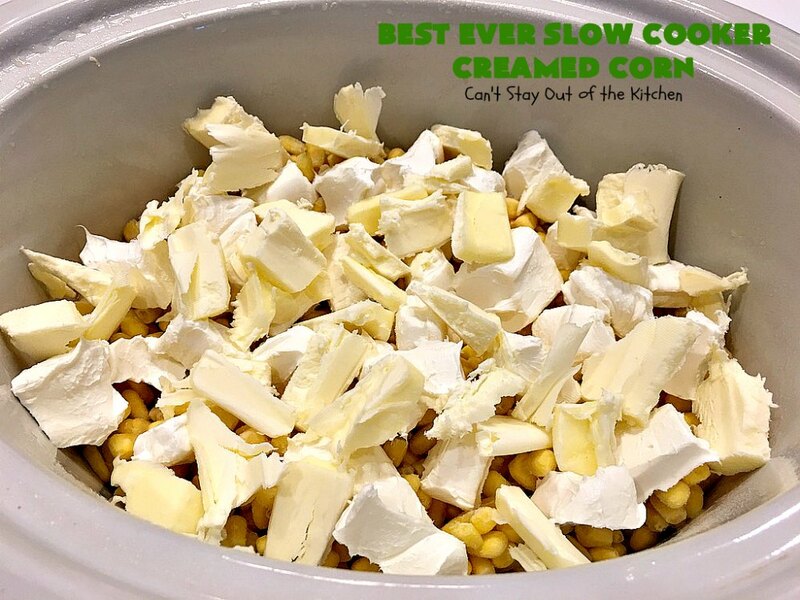 NOTE: I cooked the corn on high for 4 ½ hours because I was using a crockpot that runs slow. NOTE: Don’t be freaked out about how thin the sauce looks for this creamed corn. The corn will thicken as it sits out. NOTE: If you enjoy a sweeter creamed corn, I highly recommend increasing the sugar by one to two tablespoons. Recipe adapted from The Slow Roasted Italian. 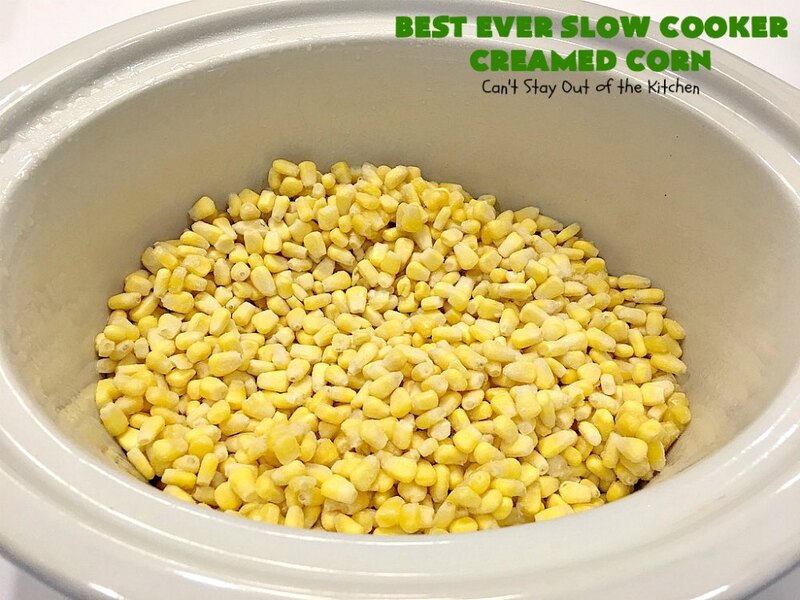 Best Ever Slow Cooker Creamed Corn is a great side dish for any meal. 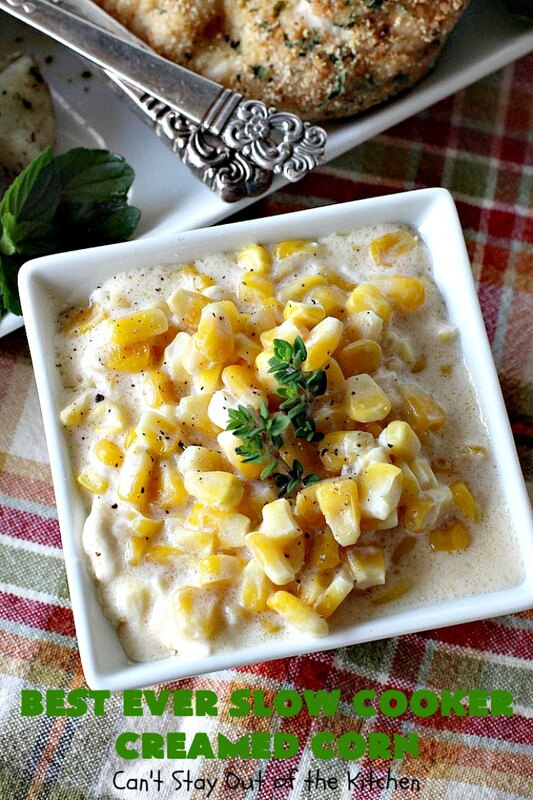 This tasty veggie thickens up as it sits out making the texture nice and creamy. 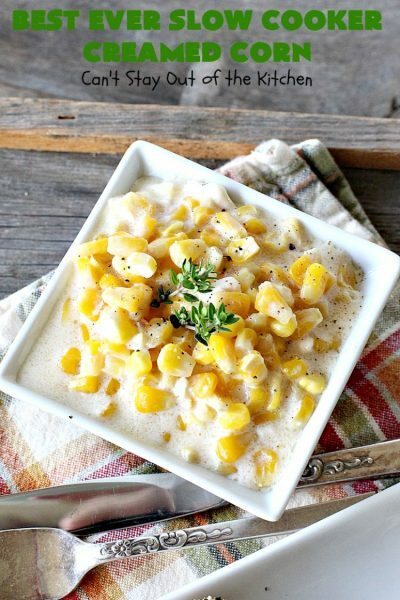 If you enjoy corn, this is one recipe you have to try! Hi, Emma. It was really good. As it sat out, it thickened up which was really nice. I can`t bring up the receipe. Deloris, It’s almost to the very bottom of the post. There’s a blue printer icon in the top right hand corner of the recipe card.